For this first Friday of March, The Beer Nut in Dublin is choreographing the world's beer bloggers in the synchronized blogging experiment known as The Session. The Nut decreed that we write about "cold, fizzy, yellow" light lagers -- challenging us loudmouths who go on and on about the latest Imperial This or Double That to "return to our roots as beer drinkers". The Lager Session... think, think, think... I've got it! 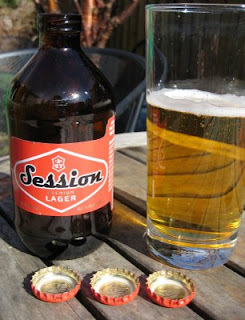 I'll write about Session Lager, the cheaper beer that Full Sail markets to those who refuse to drink craft beer. As part of my research, I picked up a twelve-pack of 11-ounce stubbies for $11. What qualifies for cheap sure has changed over the years: in the mid-90's in Austin my cheap stubbies of choice were $2 six-packs of Pearl. That's not really my roots as a beer drinker -- I consider Shiner Bock to be my early muse -- but it was a reasonable way to stretch the budget at the time. What can I say about Session Premium Lager? Well, it's cold, fizzy, and yellow. Tastes to me like Pearl or Miller High Life. In the narrow range of lawnmower beers, it's at the more flavorful end. If you absolutely must down something cold, cheap, and mildly alcoholic, you may as well make it a Session, especially if you're here in Oregon and want to drink local. The little bottles of Pearl back then had entertaining rebus puzzles under the bottle caps; Session's caps have rock-paper-scissors drawings on them. What are those for? It wouldn't make a good drinking game, because both players have to open their bottle to play. Maybe you could use it to decide who buys the next round, but who wins a three- or four-person game? Even though Session won't be a common choice for me, I'm glad Full Sail took this direction. It gives the cheap beer crowd a local choice, and it might also entice some of them to branch out to better beers. One suggestion to Full Sail: you should make Session even more versatile by selling it in cans. I have to say, when the temp hit 100+ last August for three days running, I bought a half-rack of Session and found it ideal for the weather. Still tasty, but cold and quenching. Not an all the time beer, but when you need it, so glad it's there. But here's my big complaint about Session – those damned 11-oz. bottles. I bought a 12-pack of this some time ago, and thought, "Wow, what a great price for a 12 pack!" Then I noticed that the bottles were 11 instead of 12 ounces. Hey, they shorted me an entire beer! Lee: If they sold it in 13-packs, you'd only be short an ounce. I think they could totally supplant Pabst in Portland if it came in tall-boy cans. You are totally missing the point on Session - it's not Price Point but transitional flavor from what Bud, Miller, Coors dream to be - an all malt easy drinking beer with magical qualities. For me, the magic in Session is that I can't put it down. I take a swig and before I can set it down, I'm picking it up for another swig! Works the same way when I finish a bottle. I'll next purchase the latest greatest double tripple imperial hop slam and, what follows that assult on my senses? Right! another Session. I can't tell you how many times I've done this. Session, Extreme something or other, Session, Extreme Something. Guess I'm addicted to Session Sandwiches? Bob: I haven't got any magic out of it yet, but I like your idea of Session as a chaser or palate cleanser. I still think the price point was part of Full Sail's plan. Otherwise it would say "Full Sail" in big letters on the label, and they would sell it at their usual price.